We’re tired of your anti-Black antics. Some of you seem to think that celebrating Blackness is anti-American. Are you mad that Beyoncé came hella Black at the Super Bowl? Are you mad that her backup dancers’ outfits paid homage to the Black Panthers? Does it really “grind your gears” that she mentioned her baby’s nappy hair? Y’all hate on anything that celebrates Blackness, including Black History Month, the Natural Hair Movement, #BlackGirlMagic, scholarships for Black people, and Black Michael Jackson. Can’t you understand that everything is NOT for you? You already have the Oscars, white-washed Egyptian casts, the next presidency, white privilege, Stacey Dash, and most of the other months of the year. Beyoncé’s performance was not for you. It was for Black History Month, for the anniversary of the Black Panther Party, for a celebration of Blackness, and much more. In a society where Black people have been looked upon as second-class citizens, where politicians do nothing about our issues, where our justice system fails to acknowledge the loss of our innocent lives to their establishment, we continue to prosper. We collectively slay with #BlackGirlMagic and we continue to seek justice and equality despite all roadblocks. So excuse us if we feel like twerking celebratory when Beyoncé says she keeps hot sauce in her purse. And if you can’t handle us celebrating our blackness, you may want to ask yourself why blackness is so offensive to you. You may need to consider why everything has to be the “white way” in order for you to accept it. You may want to look at why you always have to make your whiteness a priority. And ask yourself: Why am I a racist? It’s 2016, y’all. If you don’t want progress in our nation, which includes the advancement of people of color, then you sound like the anti-American ones to me. Because people like me want better for our country. We want to expose and demolish racist systems of oppression. We want to feel like equal American citizens. We know that may take a while. But if you all would collectively back away from your keyboards and cease the movement of your tongues, it’ll only take a few minutes for you #BoycottBeyonce assholes to STFU. Now excuse me while I get in formation. On a jog one morning through the streets of Buenos Aires, where I’d been studying abroad, I caught a glimpse of a small black figure in the window of a bakery. I stopped and stared into the window for a while, until one of the workers in the shop came to see what the problem was. I couldn’t explain it to her, because I didn’t think she would have fully understood my feelings of shock and disappointment about the figure. 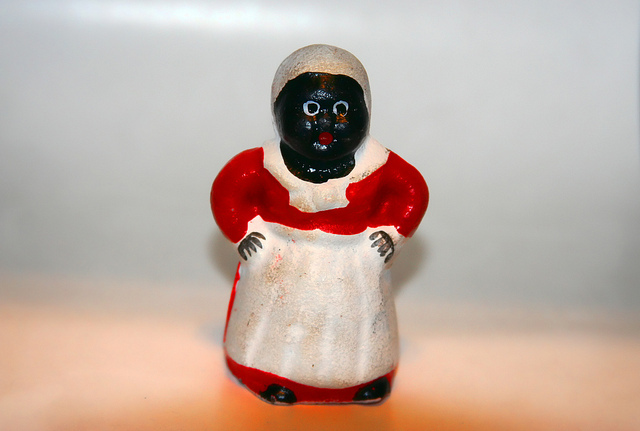 Other than the two I’d traveled to Buenos Aires with, that ceramic mammy was the only black face I’d seen in weeks. A month after my mammy sighting at the bakery in Belgrano, a small middle class neighborhood in the city, I found another one in La Boca, a lower class neighborhood with the popular tourist attraction Caminito, which is known for its brightly colored buildings and association with Tango music history. In an old house that doubled as a museum, a non-black friend of mine said, “Look Shae, there’s you.” I turned in the direction her finger was pointing to find a life-size mammy statue standing just under a clothes line. It bothered me that the mammy, which sparks much controversy and points directly to our nation’s racist past and present, is one of few images of black people in plain view in Buenos Aires. Yet, the figurines acted as another form of proof of black presence and influence on Argentine culture. Though hidden, Argentina is saturated with cultural influences from the African diaspora. Visit Caminito or any milonga (a dance hall for Tango) on any night of the week, and you will find many people dancing Tango, a dance largely influenced by African slaves in the country. Walk through the famous outdoor market, the Recoletta fair, on a Sunday afternoon, and watch men dressed in white performing Brazilian-style capoeira, a martial dance created by Angolan-Brazilian slaves. On any Thursday morning, stop by Plaza de Mayo, the plaza located in front of the famous Casada Rosada, where the nation’s president works, and watch the mothers of los Desaparecidos (the Disappeared) march to remind their country of a time when their government kidnapped, tortured, and killed their loved ones. The mothers march under an image that many black feminist scholars associate with the “dark feminine” Black Madonna. Sadly, this is a history and influence that many Argentines are extremely unaware of. I asked nearly every Argentine I met why there so few black people in their country. The replies usually fell into three main answers: There were never any black people in Argentina, they all died of yellow fever in the 1870’s or they all died in wars against Paraguay or Britain. Of the many tours I took through the “Paris of South America” during my year abroad, none of my guides spoke of the presence of blacks in Argentina. Knowing that Buenos Aires was a major slave port and that many countries that imported slaves in the past currently have a visible black population, it was strange to find so few people of African descent walking down the streets of the capital city. Actually, the locals were pretty shocked to see me in their hometown. Normally, they stared relentlessly, touched or kissed my skin or asked if I was from Brazil. Their reactions to my skin color and the lack of blackness in the country left me thinking: Why the hell is this country so whitewashed? Who were the Afro-Argentines of the past? And where are they now? Buenos Aires isn’t the only country with a hidden African past. Other countries such as Mexico and the U.S. Virgin Islands are known to have found Negroid skeletons dating back to B.C.E. There are plenty of countries overseas that have African influence due to African exploration, international trade and slavery. Sometimes, that history has to be intentionally sought out, as it may not be always be taught in schools and is not common knowledge. Sometimes information from the locals and stories from friends can point you into the right direction. My academic professors didn’t talk much about African influences on their country, but my tango professor did. Because of all the myths about tango originating in Europe, she wanted us to get it right. She taught us how tango was formed, including its influences from black Argentines. Asking the people around me gave me a general since of the common beliefs about black history in the area. Comparing it with scholarly works helped me to figure out what was possible and what didn’t make sense. Because I knew that some of my friends’ answers about Afro-Argentine history were blatantly wrong, I had to search even further. Online articles and books pointed to myths that the first president was partially black. While many scholars did not prove this to be true, as calling someone mixed race in those days could have also been a political slur, the myth and its alternative point to clues of how black people were viewed after slavery was abolished. Scholarly texts online, books and news articles can fill gaps in knowledge and understanding. Additionally, finding a black advocacy group, like Africa Vive in Argentina, can help piece together information about the current status of black people in the country. It may be easier to look to the country’s arts for a link to its African roots. The types of music the people listen to, the popular styles of dance, the clothing they wear and other subtleties can give hints and clues to additional cultural influences. Photo courtesy of Richard Elzey via Flckr.